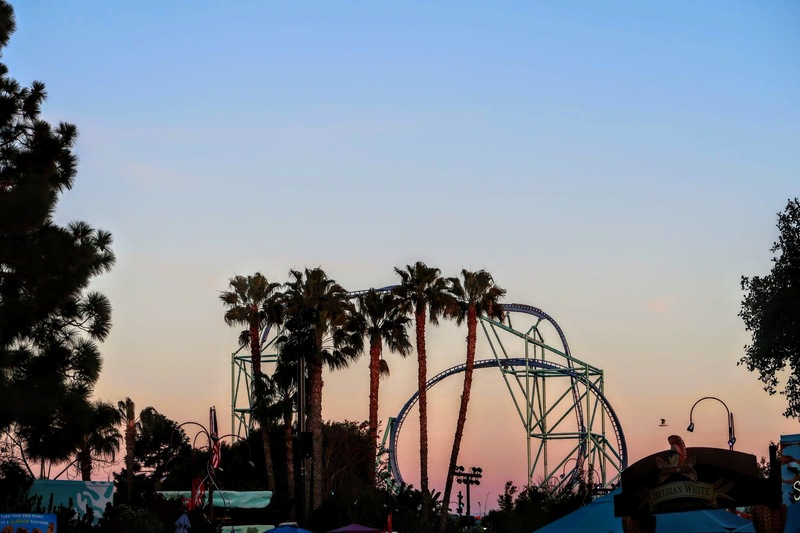 SeaWorld San Diego has always been known as one of the world’s top-tier marine parks since opening 55 years ago, but did you know that the park is home to one of the best culinary events in Southern California? That’s right! 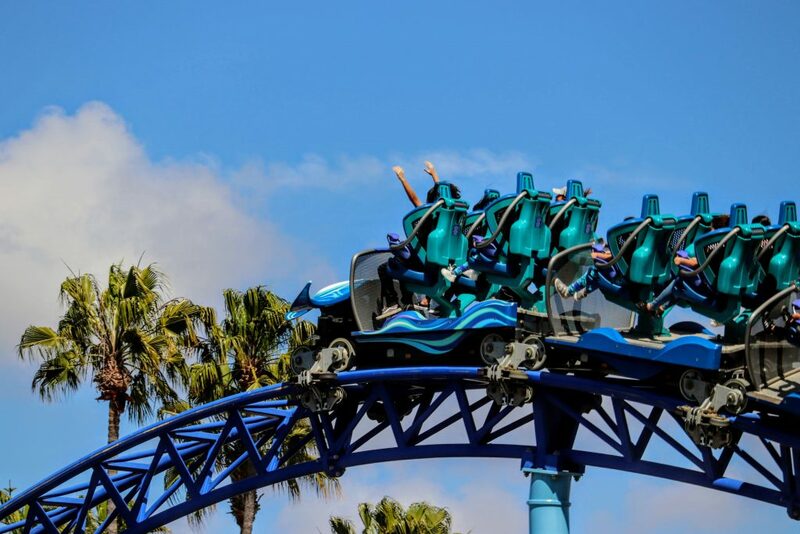 Over the years, SeaWorld has perfected an assortment of dishes that allow park guests to take a ‘trip around the world’ without leaving the park. 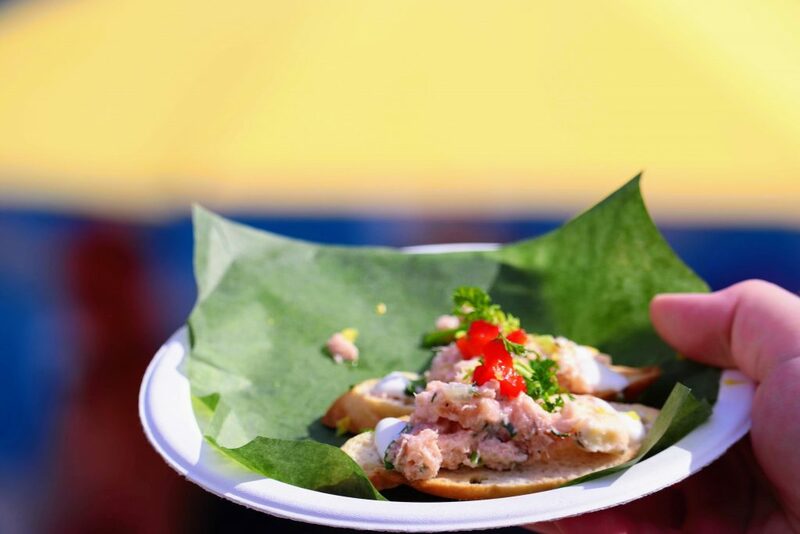 The Seven Seas Food Festival, which runs on weekends until April 28th, features delectable treats from regions such as South America, the Mediterranean, Europe, Asia, and the Pacific Islands. 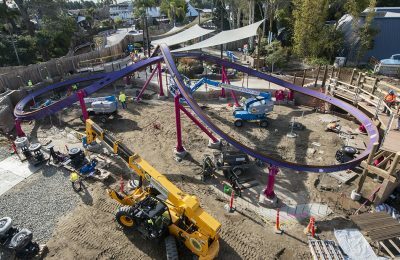 This year, SeaWorld introduced 33 new food items, bringing its total to 55 different delicious dishes. Here’s how the Seven Seas Food Festival works: Different areas of the park are themed to different countries. The areas represented are Greece, France, Italy, the Caribbean, Latin America, the Pacific Islands, India, and California. Each area may have one booth or multiple booths serving different types of dishes. 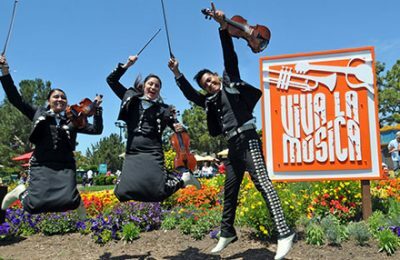 The three main “hubs” of the festival are the SoCal Flavors, Polynesian Flavors, and French Flavors areas since they feature food, alcoholic beverages, and live performances. We got the chance to experience the festival last Saturday, and we can’t recommend it enough. 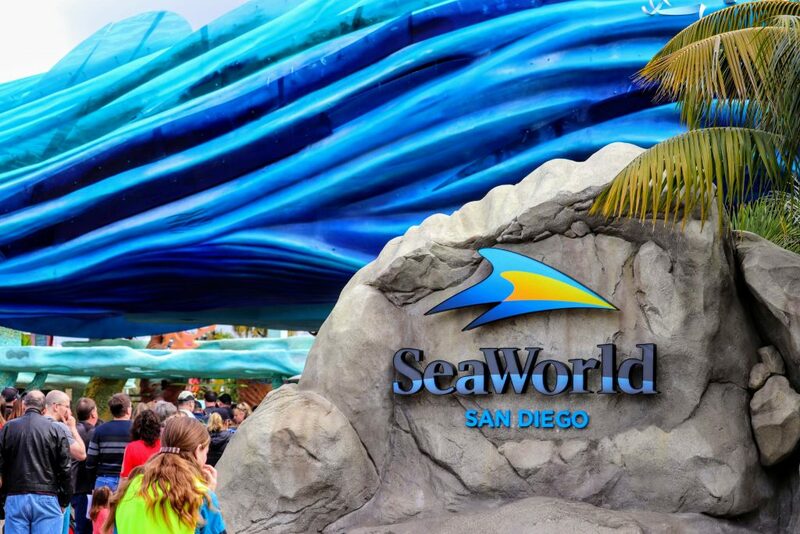 Here are some things that you need to experience when you visit SeaWorld San Diego during the Seven Seas Food Festival. 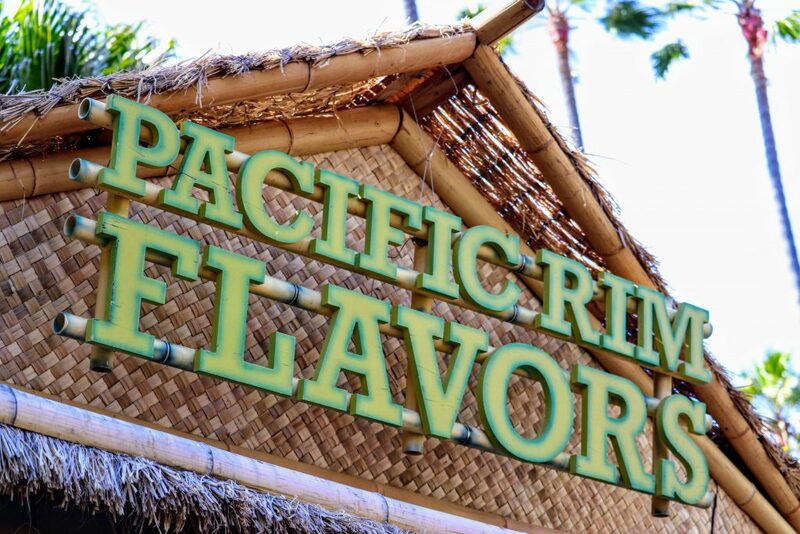 The Polynesian Flavors Stage is located in the back of the park by the Bayside Stadium and Shipwreck Rapids, and its location is historically significant because the old Hawaiian Punch Village opened in the same location just a little over 55 years ago. The area features two food booths and two drink booths. One drink booth serves specialty island drinks while the other one serves beer. 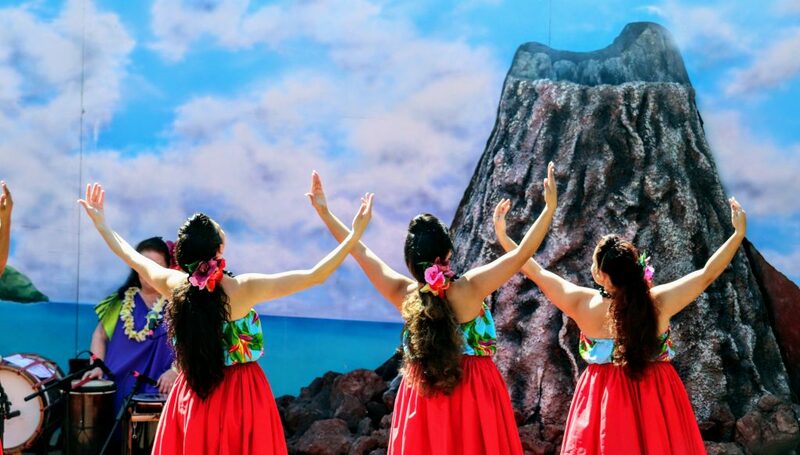 There is a Hawaiian-themed stage with a volcano that puffs smoke every few minutes. We watched performances by hula dancers and listened to ukulele music, and it definitely felt like we were transported to Hawaii! When the sun sets, the Polynesiann Flavors area gets even more lively as the talented Fire Dancers put on an amazing performance with… you guessed it… FIRE! The Chicken Katsu was a great, flavorful first sample. The chicken was grilled to perfection – not too crunchy. 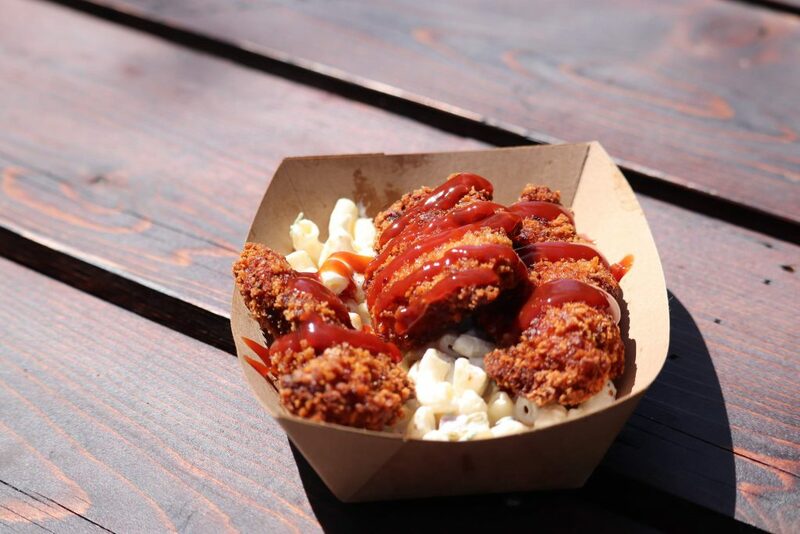 The sauce really complemented the chicken and didn’t overpower it. In addition, the macaroni really stood out. Since it’s part of the Island Fusion Flavors, pineapple juice was added to the macaroni salad, which gives it an amazing flavor. Overall, it was a lot of tasty food packed into a single dish. 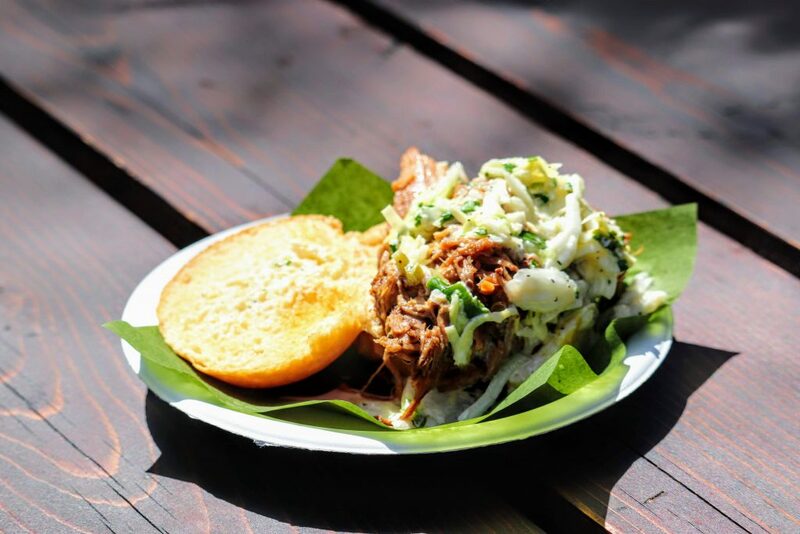 If you’re a fan of pulled pork sandwiches, you’ll love the Kalua Pig. The meat is really tender, and will melt the second it touches your mouth. The coleslaw inside has chunks of pineapple, which reinforce the Island flavor. 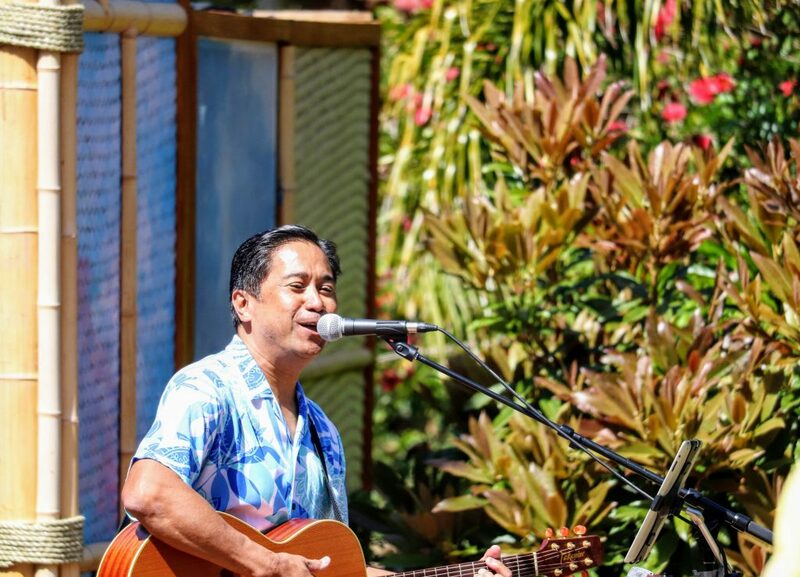 Just like the Polynesian Flavors Stage, the French Flavors Stage also features live performances and food booths. The whole area sits between Wild Arctic and the Penguin Encounter, and is themed to a French festival. Many tables and chairs are set up around the stage so that you can listen to music while enjoying the awesome food. The performers sang a variety of songs in both English and French, and we even sang “Happy Birthday” to commemorate SeaWorld’s 55th Anniversary! The smoked salmon was one of my favorite dishes due to its freshness. The hint of lemon made the salmon especially flavorful, and you could also taste the cilantro. The crostini made the dish relatively easy to eat, even without a fork. In fact, most of the Seven Seas dishes can be eaten without any utensils. That’s great, especially when you want to move around while enjoying your food. 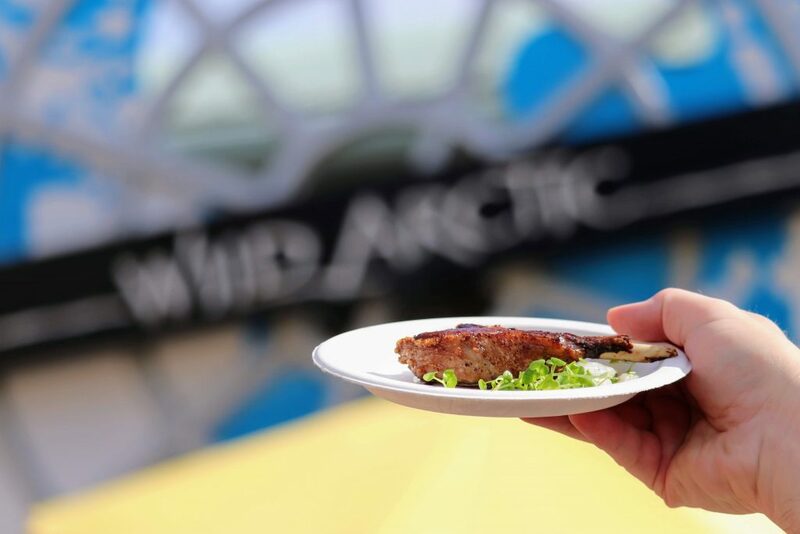 The Lamb Chop Lollypop was one of the most popular dishes in the French Flavors area, and it’s pretty obvious why. It was fully cooked but still retained its tenderness. The Lamb Chop came with a vinegar-based sauce, and it complemented the meat well due to its sharp flavor. 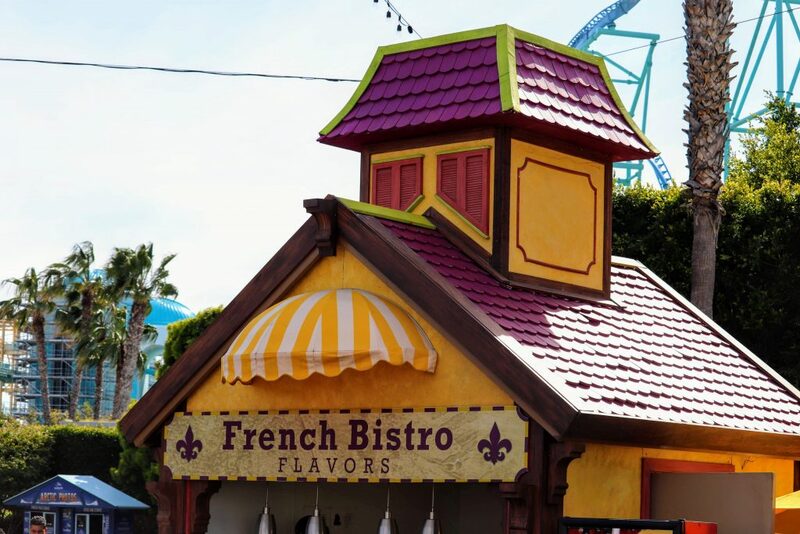 The French Flavors area has a booth totally dedicated to desserts, and you HAVE to try them. My favorite dessert was the Nutella Banana Crepe. 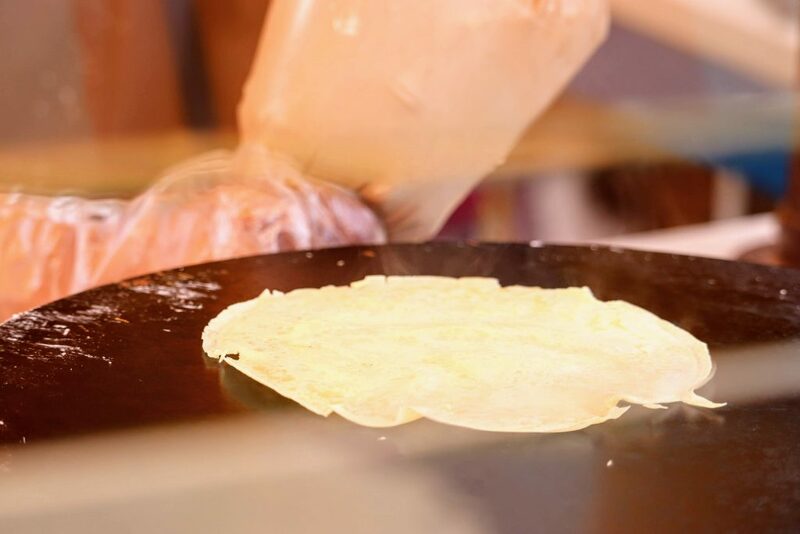 Once you order, you get to see the thin pancake made right in front of you, and by that time you’re ready to order another one! 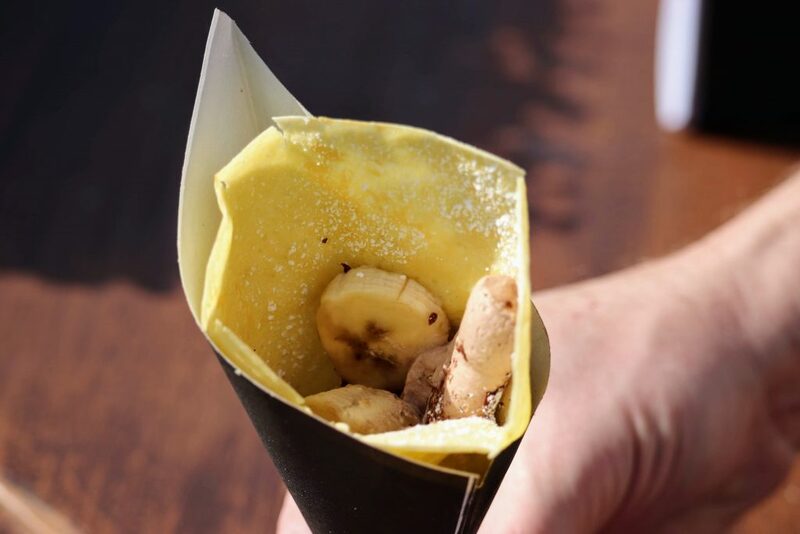 The Nutella-Banana combination is truly delectable. Other deserts found around the park include Chocolate Mousse and Beignets. Beer offerings during the Seven Seas Food Festival change on a weekly basis. 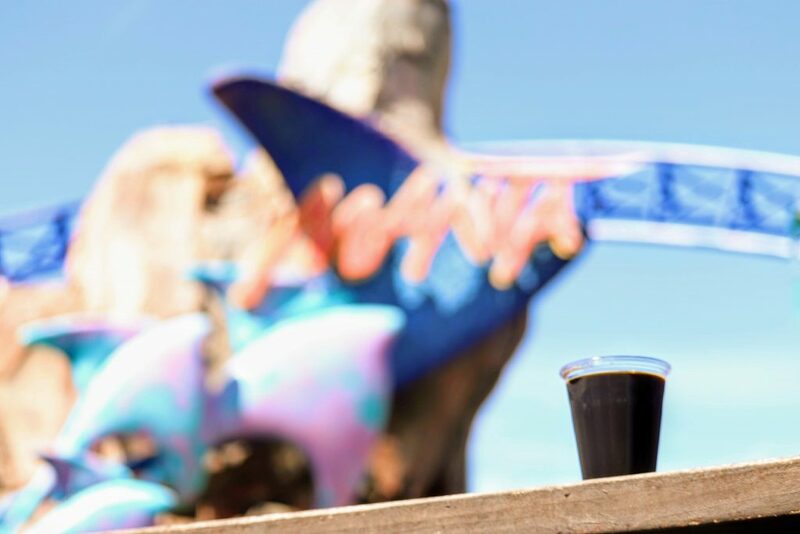 To find out which breweries will be present on the day you’re going, you can visit the SeaWorld website here. Overall, it was easy to tell that a lot of work went into the planning and execution of this event. Everything was done professionally and the live performances added so much to the festival atmosphere. The quality of food is totally on par with Disney, and the affordable prices allow you to try as many dishes as you want! Here’s the biggest tip for when you visit – the sampler lanyard is a great deal! Instead of paying for individual food items, you can buy a 10 or 15 sampler lanyard. Every festival dish is covered under the food sampler. The cashier will punch the lanyard to show how many samples you have left. The 10-item sampler gives you a deal of $5 per item, while the 15-item sampler gives you a deal of $4.33 per item. These deals are exceptionally great since most food items are in the $6-7 range. 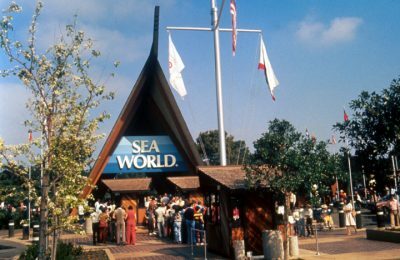 The Seven Seas Food Festival is a great time to visit SeaWorld due to everything the park offers. 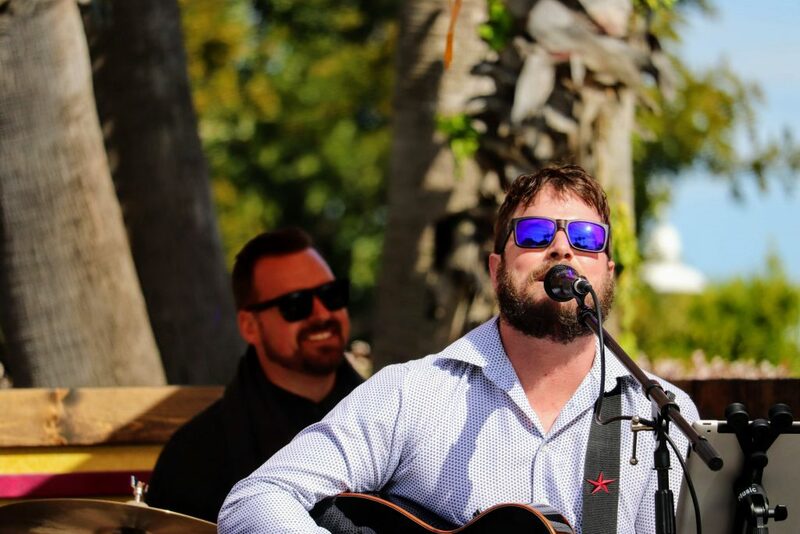 You can watch animal shows, ride your favorite roller coasters, or just sit back, relax, and try new food while listening to live music. The Seven Seas Food Festival runs weekends until April 28th. Don’t miss it!